Mario Garcia both looked at the present in 1991 and his hoped for future in a quote included on his baseball cards that year. "I feel good to be able to play in a great city," Garcia said, according to his card. "My goal is to make the show and become a great pitcher." Garcia's 1991 present saw him playing in his second year as a pro, in rookie ball at Huntington with the Cubs. His future, however, included just one more season. His future never included the show. Garcia's career began in 1990, signing a pro contract out of his native Dominican Republic. He later played in the Cubs organization, though it is unclear who he signed with originally. 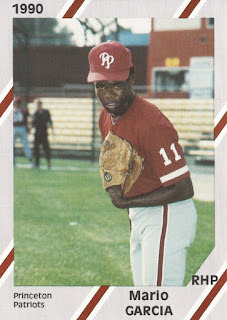 Assigned to rookie Princeton for 1990, the pitcher Garcia got into 15 games, starting one. He went 3-2, with a 5.40 ERA. He also collected one save. Garcia moved to rookie Huntington with the Cubs for 1991. He went 1-2, with a 2.19 ERA over 22 relief appearances. He then returning to Huntington for 1992, but got into only 11 games in relief. He went 0-3, with an 8.56 ERA, ending his career.